Bushwick Restaurant Week co-founder Nick Gilbert showed the tread on his shoes. That is to say the severe lack of tread, “These were new when we came up with the idea for this thing.” Since mid-March, he and his business partner Bob Murray have walked all over Bushwick, East Williamsburg and Ridgewood to cultivate a roster of restaurants, bars and cafés to make up the weeklong event. They are finally ready to release a list of participants entailing the fruits of their efforts. 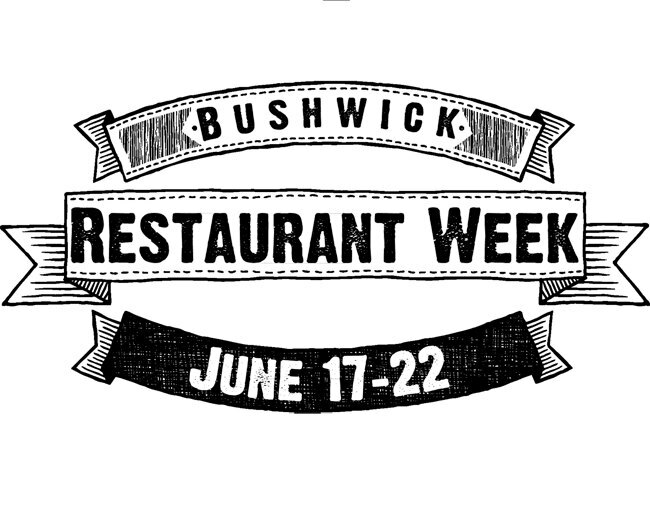 Bushwick Restaurant Week will take place from June 17th to June 22nd. Two weeks after the closing day of Bushwick Open Studios. The two events seem to share similar spirit animals, considering that Bushwick businesses benefit from the influx of arts-seeking tourists during the BOS weekend - conversely these same businesses often employ those same artists and sometimes have the work hung on their walls. Bushwick Restaurant Week’s shape had been forming lugubriously when we sat down for an interview with Mr. Murray and Mr. Gilbert (full disclosure: the author of this piece has worked with both gentlemen in a local restaurant). Now that the two are prepared to release the participants, we have agreed to release the interview alongside this information. In asking what the idea entails, Mr. Murray explained that the Restaurant Week included bars, cafés and restaurants across the mindset that entails Bushwick. Many are keen to point out that this often entails East Williamsburg, Ridgewood and Bed-Stuy in addition to Bushwick proper. The blurring of neighborhoods is natural and irrational - with some pointing toward to car insurance rates or zip codes to benefit their argument for or against Bushwick’s ambiguous borders. A certain amount of the creative onus rests on restaurant owners and their chefs. Part of the signing up for BRW has been to fill out a questionnaire that will generate a program of sorts. One detail that has emerged is the $5 bottomless cup of coffee from participating cafés & bottomless ice cream from Evergreen Ice Cream. In addition to this, we've been informed that Uber Car Service will offer $30 coupons to new sign-ups to their service attending Restaurant Week.